In 2011, India’s population has exceeded 1.2 billion, the second in the world, it has more than 1/6 of the world’s population and annual population growth rate was 1.35%. From 2011 to 2012, India’s GDP growth has reached 6.9%. Nowadays, in the condition of America, Japan and the European Union have encountered economic difficulties, its impact on India is not very big. Pulp and paper making line: India’s paper and paperboard production capacity, accounts for only 2.5% of the world’s total output. Relevant departments predicted that in the next five years, India’s paper and cardboard consumption will increase from the current 12 million tons to 17 million tons. Even so, India’s per capita consumption of paper and cardboard is only 14 kg, far lower than the 57 kg of global average per capita consumption level, the India market has huge potential. 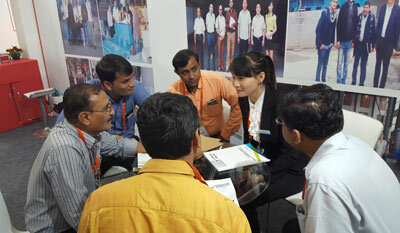 Equipment requirement: Although India’s paper industry occupies very important position in national economy, but the industry layout is relatively scattered, mainly is some small and medium-sized factories. In the face of growing demand, enterprises need to update equipment, modernize. The automation equipment investments of India paper industry growths at a rate of about 8.5% per year. In the past few years, India’s demands for paper products has been growing at a rate of 8% ~ 9%. With the increase of per capita disposable income, India paper industry will continue develops. continually and rapidly, and also provide the opportunities for Chinese enterprises to enter the Indian market.